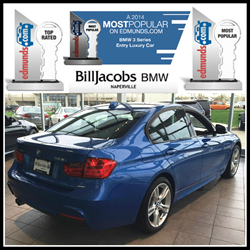 Bill Jacobs BMW of Naperville is excited to announce that 4 BMW models recently won the Edmunds' Top Rated and Most Popular Vehicle Awards for 2014. Bill Jacobs BMW is proud to be the home of Edmunds’ four most popular vehicle entries, and welcomes the public to stop in for a test drive to see what sets these vehicles apart from the competition. The Edmunds Testing Team evaluates about 200 cars each year. Each vehicle is driven on a standardized road test loop and undergoes instrumented testing in controlled conditions. The Edmunds team uses their findings to develop ratings to grade how a car stacks up against its direct rivals in its size and price class. Each month, Edmunds.com also evaluates new vehicle shopping activity of the users visiting their website. By measuring the unique website visitors who land on research and inventory pages on Edmunds.com for each new model on a monthly basis, they derived the Most Popular Vehicle list from the three models in each vehicle segment with the highest online car shopper consideration across the calendar year 2013. During the 2014 New York Auto Show, Edmunds made a trophy presentation to the BMW executives in attendance. Bill Jacobs BMW of Naperville is excited to share this news with the community, and looks forward to celebrating this accomplishment by offering a great selection and unmatched incentives on these award winning vehicles.